It’s nine o’clock on a school night, and your kids are getting ready for bed. Some days, just the simple act of brushing their teeth is a hassle. Even more, trying to get them to floss seems like an impossible task. But, there are several health benefits that make flossing more than worth the effort. 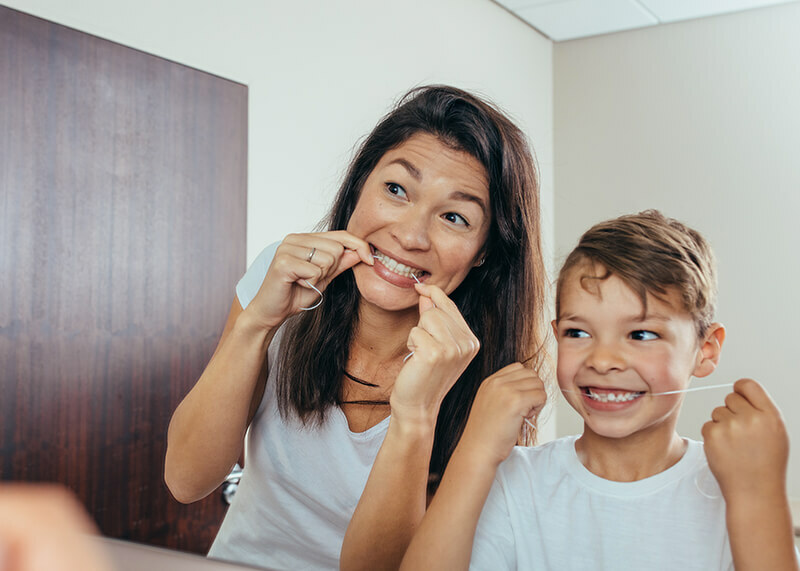 Read on for some important facts about flossing and why it should become a part of your family’s daily routine. Because flossing reaches the spaces where brushing alone might miss, it’s helpful in preventing gum and tooth damage. In fact, plaque, which is a sticky coating on your teeth known to lead to tooth decay, is greatly reduced with regular flossing. When compared to brushing alone, routine flossing and brushing can lower plaque 1 to 3 months more quickly. Flossing has also been known to combat gingivitis, which is caused by short-term plaque build-up around your teeth. This type of gum disease often flares up during puberty thanks to increased levels of hormones. Therefore, flossing is especially important for young adults and adolescents. While brushing, you probably focus on the cleanliness of your teeth. However, keeping your gums healthy is essential for complete oral hygiene. Gums help you chew food and keep your teeth from shifting around in your mouth. Flossing helps eliminate food that hugs your teeth close to the gum, which can reduce swelling and irritation. And, did you know that healthy gums and teeth can contribute to fresh breath? Another fact about flossing is that it’s not just for adults. Even new teeth can use the care that flossing delivers. Flossing can begin as early as age 2, although your child may need guidance up to the age of 10. Flossing at least once a day for 2 to 3 minutes will help remove debris from those hard-to-clean areas. Not to mention, it will keep your child’s teeth looking polished and white. These days, there are many types of strategies and tools to make flossing easier for children. The spool method entails winding the floss around each of your index fingers and gently removing residual food in an up-and-down motion. Alternatively, some kids may prefer the loop method. This is where you wrap a loop of flossing string around your fingers while controlling excess string with your thumb. For younger children or those new to flossing, pre-threaded flossing picks are very useful. Floss picks feature a handle that holds the floss for your child, which lets them focus on getting the best clean. At Tooth Fairy Smiles, we give you the tools you need to maintain a healthy smile long after your child’s appointment. Contact us today to schedule a procedure, plan a preventative checkup, or to learn more facts about flossing.